Out of the pages of the most recent issue of MAKE: California artist Chris Burden built a Hot Wheels track of epic proportions. 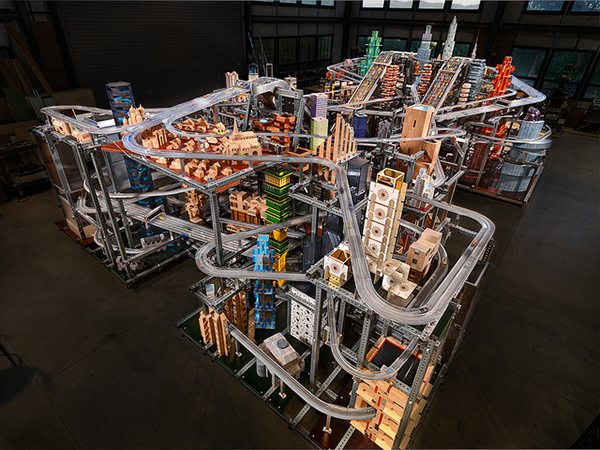 Burden’s kinetic sculpture Metropolis II is a mesmerizing cityscape where 1,100 toy cars blaze down 18 lanes of freeways in endless loops. The work took Burden, his chief engineer Zak Cook, and ten assistants four years to build in his Topanga Canyon studio. Pick up your copy of MAKE Volume 26 up in the Maker Shed. Available in PDF as well! Or subscribe – of course!